Tom, where did our blogs go? My introduction to social media was probably very similar to everyone else in the Universe. It was 2005, and I was living with my brother after his divorce, helping with the kids and working in my brother's bar, Castaways. I woke up one morning, oh who am I fooling, it was two in the afternoon, and saw this message scrawled on one of the bevnaps from the bar: "Try www. My Space. See if you get anything." Not sure what he meant by "see if you get anything," but I did try it. Since Myspace was originally designed to promote music, and since I was just starting to book local bands for the bar, it was something that fit right in to my life at that moment. I was way over my head in terms of being the General Manager of the bar, and had no idea how to even book a band, run a promotion, or go about creating events on particular nights to lure people into Castaways. 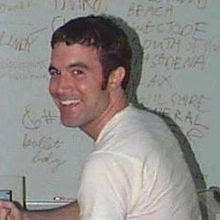 But it was the secondary effects of Myspace, and social media, that changed my life, and probably most of yours. It was social. Duh. Well, not duh. The prevailing wisdom about the internet before Myspace seemed to be you should never use it to meet people, share anything about yourself, or divulge anything that might lead to being murdered by a serial killer, or having your very life, identity, and contents of your house, storage shed, and bank account stolen by an identity thief. We take for granted now that it's alright to have a Facebook account where you tell people what you just ate, where you work, who you are in a relationship with, where you went to school, even post pictures of your children, but in 2005 there wasn't even really a place to do that, and almost nobody would have if they could. Things have changed. A lot. In a very real way, at least for me, there is life before 2005 and discovering social media, and life after social media. I really hated to see Myspace go. Mainly because I had invested several years into making that platform my home for promoting the bar, finding bands, and keeping in touch with all the friends I'd found there. I resented Facebook and resisted migrating there. I figured it would just keep happening like this, and every few months for eternity we'd all have to get up and move everything to the next flavor of the month social media site. I'd had a decade of living like a gypsy, and in "real life" I still was leading a very nomadic life, so I really enjoyed the sense of stability Facebook offered. Facebook was better, and it succeeded even further in destroying the old stigmas against sharing on social media. Now even your grandmother was on board. There were, and are still some holdouts, who will probably never use Facebook, but almost everyone now feels safe and is willing to participate. So, Myspace. You really screwed us. Like a bitter, jilted lover, Myspace dumped all those years of blogs, pictures, messages in June of 2013. I never go there anymore, but it occurred to me recently that between 2005-2008 I had done all of my blogging on Myspace. I didn't even keep another blog. I wanted to go back through that archive and see if it was worth migrating those blog entries to Zombie Logic, even though Google would probably whack my peepee for duplicate content. I had worked hard on those blogs and wanted them to be archived somewhere permanently. But they were gone. Nearly 200 blog entries and over half a million views, and it was gone. Mostly my own fault, but why would Myspace do that? Cyberspace is infinite, and not even making those entries available to people who had been using them for almost a decade borders on a type of cruelty. True, Myspace was a ghost town, and everyone had abandoned them long ago, but how much effort would it have taken to at the very minimum give a warning that your old archives were about to disappear. That was part of our lives. Myspace was important. We all know nothing on the internet never disappears, so perhaps in the future Myspace will make all those archives available to their old users. It would be the right thing to do. Not that I believe those blogs were Earth-shattering, or have much importance to anyone but me, but they do have importance to me. I acknowledge my error in not migrating those blog entries if I considered them worth saving, but I never anticipated Myspace erasing their entire history. It's a history that is also a history for millions of people. We move on. Quickly. It happens in the music industry, in the bar and restaurant industry, and it happened in social media. Is this the way we will live our lives now? Every couple of years we all get up, leave whatever social media platform we were all using, and move on? Leaving behind our histories. I'm not sure. I know I never want or feel the need to move on from Facebook now, not because it's so great and indispensable, just because I have learned this lesson once from Myspace. Whatever flaws Facebook has, I'm willing to accept them for a sense of permanence. Don't ever Myspace us, Facebook.